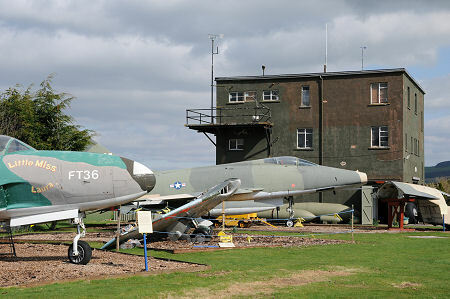 The Dumfries and Galloway Aviation Museum occupies the control tower and surrounding area of what was once RAF Dumfries, two miles north east of the centre of Dumfries and well signposted from the A701. What you find is one of Scotland's best and most varied aviation museums and, for anyone with the slightest interest in aviation, a superb day out. At the heart of any good aviation museum is its collection of aircraft. Dumfries and Galloway Aviation Museum has a remarkably large collection on outdoor display. It would be fair to say that many show signs of age and are in rather less than showroom condition. But this brings considerable benefits. In particular it means that the museum does not feel the need to rope off exhibits, and visitors are encouraged to get up close and personal with the aircraft on display. In addition a number of aircraft cockpits are accessible, as is the flight deck and cabin of the museum's Hawker Siddeley Trident. Aeroplanes are as individual and varied as the humans who make and fly them, and enthusiasts inevitably form favourites. The aircraft collection here is sufficiently large to ensure that many people will find their own personal favourite types are represented, as well as other types of aircraft you might never have seen before. For us the highlight of the collection is English Electric Lightning F.53, ZF584. The Lightning was a Cold War fighter aircraft, an aircraft that first flew less than ten years after the end of World War II yet offered a truly awesome performance which in terms of sheer speed and rate of climb would be hard to match even by today's latest generation fighters. The Lightning had drawbacks, including just two missiles and (on some marks) no guns, and it particularly suffered from small fuel tanks and a very short range that meant that every time it intercepted a Russian aircraft over the North Sea it needed to hook up with a Handley Page Victor air to air refuelling aircraft simply to be able to return to bases like Leuchars in Fife and Binbrook in Lincolnshire. But despite these drawbacks we are not alone in considering the Lightning to be the best aircraft ever made. The example on show at the museum entered service with the Saudi Air Force on 1 August 1968. After returning to the UK in 1986 it was placed in storage for some years before being presented to the electronics company Ferranti. It then spent over a decade on a plinth outside Ferranti's Edinburgh factory before coming to the museum when the factory was demolished in 2000. Other classic British military aircraft of the Cold War era are also very well represented at the museum. A complete fuselage of the early (though very long lived) Canberra jet bomber can be viewed, together with a cockpit section of another Canberra. Examples of a Gloster Meteor, a Hawker Hunter, a Blackburn Buccaneer and a Jet Provost are also present from this era. Less speedy aircraft include a Fairey Gannet, arguably the ugliest aircraft that has ever flown, a Westland Wessex helicopter which saw action in the Falklands War, and a Bristol Sycamore helicopter which first flew in 1950. US built aircraft on show include a North American F-100D Super Sabre and an early Lockheed T-33 training aircraft. Other foreign aircraft include a Dassault Mystere IVA, and a Saab J 35A Draken. One of the most fascinating exhibits is the (used) escape capsule from a General Dynamics F-111 swing wing bomber. The aircraft crashed on 5 November 1975 on ranges off the Lincolnshire coast, and the crew made use of the aircraft's escape capsule, which involved the ejection of the entire cockpit section of the aircraft. In most other military jets ejection seats are used instead. Dumfries and Galloway Aviation Museum offers visitors much more than just its collection of aircraft. The focal point of the museum is the three storey control tower. The ground floor is home to a large and varied collection of aircraft engines on the floor and aircraft models hanging from the ceiling. The middle floor is home to extensive displays of aviation memorabilia that reflect of a century of aircraft and the lives - and sometimes deaths - of the people flying them. One poignant exhibit comprises material recovered from the site of an aircraft crash, including the battered hat of the pilot. 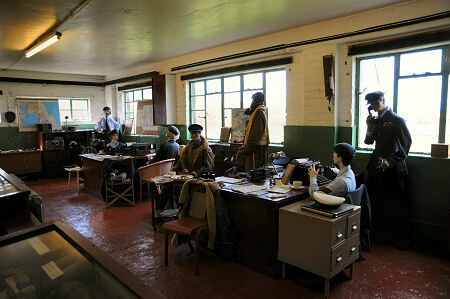 On the upper floor of the control tower is a recreation of a wartime control and operations room, complete with figures of pilots and controllers. Another building on the site houses a series of displays dedicated to Airborne Forces and in particular to the Parachute Regiment. Amongst the items on show are a range of weaponry, uniforms and parachutes, plus a restored section of the fuselage of an Airspeed Horsa glider, a type used for landings in Normandy and at Arnhem by Airborne Forces. Other displays on the site cover the home front, recreating domestic conditions during World War II, including a shop, a kitchen and an Anderson bomb shelter. One section of the site is given over to a memorial to the many aircrew who lost their lives while flying from bases in Dumfries and Galloway between 1939 and 1945. The origins of Dumfries and Galloway Aviation Museum date back to 1973, when local enthusiasts excavated the site of the crash of a Vickers Wellington bomber. HE746 had come down close to what had been RAF Dumfries on the night of 3/4 June 1943, with the loss of three lives. The engines were recovered, which raised the question of where to exhibit them. A flight hut on part of the site once occupied by RAF Dumfries was available and seemed the obvious choice, and having acquired its first complete airframes in 1976, Dumfries and Galloway Aviation Museum opened its doors for the first time in 1977. In 1979 it moved to the larger site it occupies today, which includes the now listed old control tower of RAF Dumfries. Former Control Tower, Heathhall Industrial Estate, Dumfries, DG1 3PH.